Welcome to helenfall.com! Helen is a performer and instructor of viola, violin, chamber music, and orchestral music. Explore the site to find out more. For teaching information, please visit the Studio Resources page. Research shows that music greatly benefits the brain. Read the article. Just one hour a week of musical interaction greatly increases linguistic aptitude, even into adulthood. Read the article from The Strad magazine. It’s long been accepted that music education helps students become more prepared for a lifetime of learning. New studies now show statistical evidence linking music lessons to measurable gains in focus, discipline, and critical thinking, meaning the connection between music and learning is now stronger than ever. Read more. From Forbes Magazine: Big tech employers are widening their hiring horizons beyond the STEM fields: science, technology, engineering and math. Larry Quinlan, Deloitte’s chief information officer, argues in favor of “STEAM,” in which the A stands for the arts. “It’s not enough to be technologically brilliant,” Quinlan says. “We need senior people who understand business processes, too.” Read more. We all know that studying music and art is good for your brain, but did you know that the arts are also good for the economy? Read why here. From the Wall Street Journal: More evidence that keeping music programs in schools helps boost IQ, test scores, creative thinking for scientists, and the list goes on. This masterclass will be devoted to preparation for District Solo & Ensemble Festivals and the NVMTA Strings-Only Judged Recital. Thanks to Audrey for swapping classes with Clara, who has a swim club conflict, and to Cady for swapping with Tyler, who has a high school tennis conflict on Wednesday, April 10. Due to Solo & Ensemble Festivals in District 10 and 12 on the same day, Mrs. Doris MacDonald will come to the beginning of the Group A masterclass to accompany Maddie. Performance selections and order have been posted on the upcoming events calendar on this web page. Friday, April 26 District 10 Solo & Ensemble Festival Holmes Middle School Maddie will perform Berceuse by Ilyinsky Due to the direct conflict with the District 12 Festival, Mrs. Doris MacDonald will be Maddie’s pianist for this performance. The entire Fall Studio performed at the 2019 Springfield Music Club Annual Spring Festival on March 8th. The twelve students in the studio performed a total of 34 musical selections in 22 events, representing four categories (Violin Solo, Violin Concerto, Viola Solo, and Viola Concerto)! The judges’ comments were super helpful, and scored the students with 20 Superior Ratings and 2 Excellent Ratings. Mrs. Fall is extremely pleased that EIGHT Gold Cups will be awarded at the Studio Spring Recital on May 19th!! Bravi to all!! David performed Zigeunerweisen by Sarasate at the January 12th NVMTA Judged Recital, and was awarded Honorable Mention! Cady performed Tempo di Minuetto by Kreisler at the February 10th NVMTA Judged Recital, and was awarded Honorable Mention! John, Jason and Tyler performed in the Vienna “Host” James Bland Competition on February 16th. Special shout out to Tyler, who was awarded 3rd place!! BRAVI to these Stellar Students!! At Group A's class we welcomed Maddie to the studio with cake. A violist, Maddie is an 8th grader at Luther Jackson Middle School. Group B sends a message to the newest member of our studio. Watch the video! The Fall Studio hosted a Viola Masterclass with Master Teacher, Diana Wade, on Saturday, December 22. 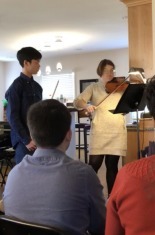 Twenty area viola & violin students and teachers attended this inspiring masterclass! Shout out to Crystal and Tyler for playing. They got some terrific feedback, and were able to take that home as they prepare for the Concerto Competition in January!